Hays are delighted to host this IT Audit event brought to you by the Chartered IIA in association with ISACA, where you will hear from inspiring guest speakers from a range of sectors. 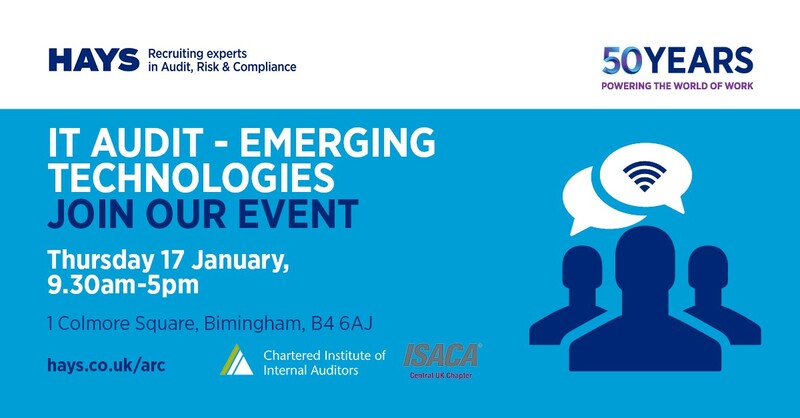 This event delves into emerging technologies and will provide you with an overview of a range of current technology risks and how you can prepare to support your organisation when managing them. Speakers will also cover innovation, cyber resilience and the role Internal Audit plays. Breakfast, lunch and refreshments provided. Hays will also be hosting a drinks event at local bar Primitivo after the presentations. We hope you can join us for what promises to be an engaging and entertaining day. To Register (as this event is free to ISACA members) - please email: events@isaca-central.org.uk with your ISACA ID and any dietary requirements.